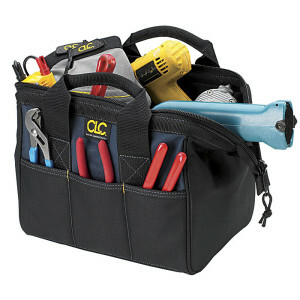 A big part of any IT professional’s role is the application of tools and techniques, and that means choosing an appropriate tool(s), using it competently, and if necessary providing guidance to others on what the method entails, or how to use or interpret the outcomes. *Although all tools and techniques should be generic, you have to know when to use a hammer or a screwdriver, ideally having knocked in a nail or fixed a screw previously! This series will borrow from the Business Analysis Book of Knowledge (BABOK) but will not be limited to Business Analysis activities or work carried out by a Business Analyst. The BABOK v3 includes a whole section on Techniques, 50 in total, from Acceptance Criteria to Workshops. I will return to look at the full list later. 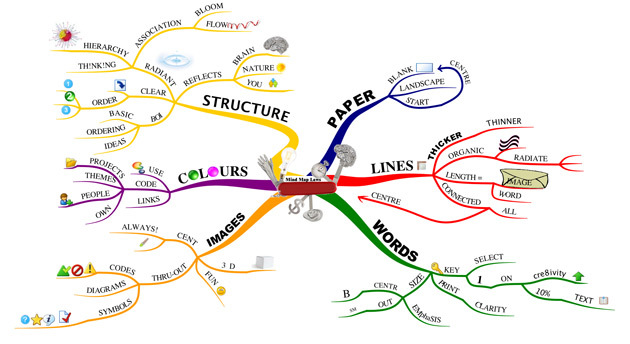 I am going to start with Mind Mapping. **oh yes, and the way we learn, remember, recall, and process, share, communicate and present information, amongst other things. 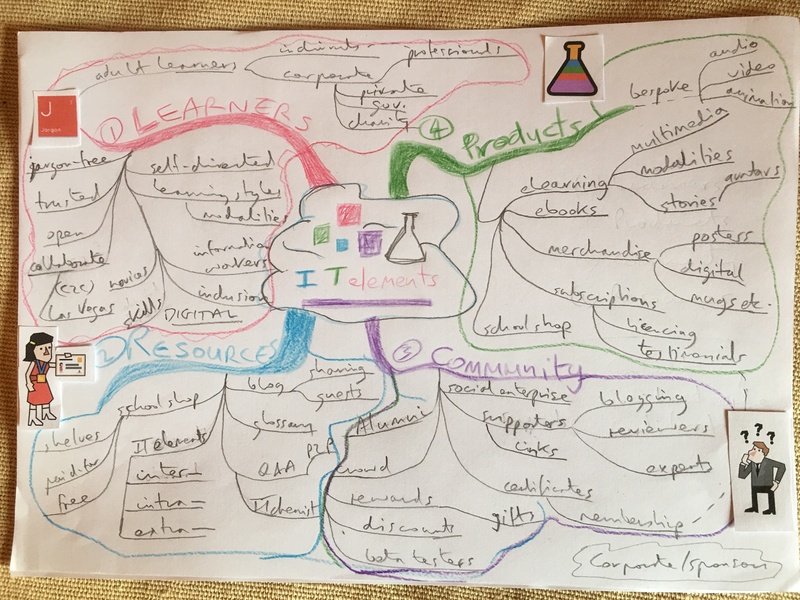 First, here’s a little background reading on the Mind Mapping system from the inventor Tony Buzan and my post about how the brain works. Well yes, but this makes it sound like an alternative form of note-taking, which it can be, but it’s a much richer alternative planning, decision-making, communication and collaboration tool as well. The example below illustrates both the style of a finished map and the system itself. It is intended to represent more closely the way that the brain captures information in the form of links or associations between ideas. 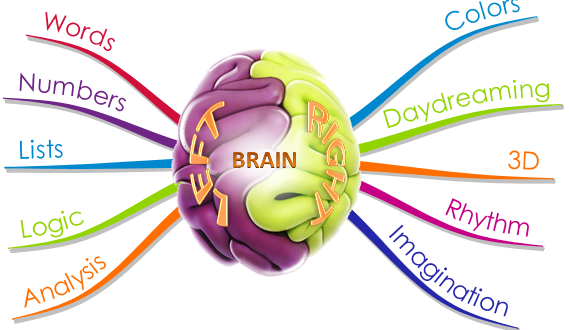 The use of colour and images as well as words and facts helps to stimulate both the left and the right side of the brain. By engaging more senses and spatial elements the content should be easier to remember and help trigger more creative ideas, thoughts and insights. Start with a picture that represents the central thought, topic or idea of interest, such as the subject of a meeting or presentation, the end goal of your project or life-planning exercise, for example. Radiate a number of related topics as single key words (called the Basic Ordering items). The use of colour, shading, the sense of movement and direction, even the width of lines – none of which should be straight(!) – is important. Here is my first attempt at capturing the essence of the IT elementary school. It is a much more creative process than I am used to, and quite hard to break away from traditional ways of presenting information as full sentences in a monochrome linear form. Now continue with further branching of sub-topics and secondary themes. Each new branch should still be a single word (key word) or key image, adding full grammatical sentences doesn’t help you process information or remember it more effectively. At best you are merely wasting time and space, but think of the lost opportunities to do things differently and better? Ask questions [of the theme/sub-theme] such as why, what, how, when and who? Calve off mini mind maps as necessary to explore a topic in more detail. Each map should be complete and consistent on its own, ideally on a blank landscape-oriented sheet. Continue to use colour and images, use ordering and numbers to prioritise elements (or icons or some other coding scheme), make the lines and the words stand-out to reinforce the overall impact and uniqueness of the map, including shading, line thickness, grouping, connections between keywords etc. It can take a bit of effort to develop a personal style and become comfortable with the technique, especially if you’re not by nature a creative, but its worth the effort. Forget linear, practice radiant thinking! If you have any questions or comments about Mind Mapping or this series as a whole, please email the Lab at the IT elementary school. (c) 2017 IT elementary school Ltd.